Delivery service Flowers.ua provides free delivery fee of flowers to Kiev. Order flowers with delivery to Kiev through our site and bring your loved, colleagues or partners unforgettable impression! For making order for flowers to Kiev you can use our catalog, or contact us by phone or . Send flowers to Kiev can be completed with a beautiful soft toy or a box of chocolates. Flowers in Kiev also can be accompanied by a free postcard. Making order for flowers in Kiev will take several minutes. Buy flowers in Kiev on our site quickly and easily. Florists of flowers internet-shop Flowers.ua able to collect floral arrangement at your request (you want some extraordinary bouquet of flowers, which is not in our catalog). Our courier service will ensure delivery the bouquet in Kiev on time. Flowers delivery to Kiev takes place 24 hours a day. As studies have shown, today flowers are the most popular gift all over the world. But flowers - it's more than just a gift, it’s a part of modern etiquette. We may give flowers in different situations and on different occasions. Getting flowers delivered is one of the kindest and most loving gestures one can do. 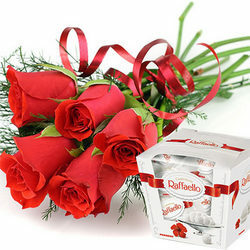 Have you noticed that we always do it with pleasure, because beautiful flowers bring joy to recipient as well as sender. Flowers help you to express a variety of feelings, emotions and bring good mood. Flowers delivery in Kiev with the help of online flower shop Flowers.ua is a great opportunity to congratulate loved-ones there. No matter where they are in Kiev, we’ll come there anyways! If you order one of our most popular flowers, 51 red roses for instance, it will be added with a charming soft teddy bear. Buying flowers, your significant other or someone else is always appreciated, and giving them makes you feel so good. Online flowers shop Flowers.ua gives you a unique chance to order not only flowers and floral arrangements in Kiev, but also gift baskets, sweets and fruit baskets delivery to Kiev. Corporate Gifts - an important part of business communication, which promotes business development, building strong relationships. Professional couriers deliver flowers to the recipient right on time. You can be sure that the bouquet of flowers in Kiev will be created with fresh flowers taking into account all your wishes. Online flower shop Flowers.ua uses fresh flowers only to guarantee the exceptional quality. Each bouquet is carefully crafted by the best florists to invoke the sentiments you wish to convey to your recipient. Choosing Flowers.ua to make your order for flowers in Kiev, you will receive prompt delivery and the freshest flowers in Kiev just in time. Online flower shop Flowers.ua delivers a bouquet of flowers in Kiev and worldwide. Our mission is to bring joy to your loved ones, and, consequently, to you - our loyal customers! Спасибо большое за услугу. Удалось порадовать отца с связи с праздником 23 февраля. Непременно воспользуюсь вашим сервисом еще. СПАСИБО ВСЕМ! заказывал из Ашхабада в Киев...не смотря на задержку исполнения я доволен приятными эмоциями. ещё,спасибо за бонусные конфеты. молодцы! молодцы!!!! работаете очень быстро и лишних вопросов не задаете))) так держать! не ошибся и ,думаю,что стану вашим постоянным клиентом!! Святослав.